When Sarah told her boyfriend she was pregnant with his child, he called the Home Office and told them her visa had expired. It was one way to deal with the fact he did not want the baby. She was arrested and detained at Yarl’s Wood immigration removal centre, a secure and closed building on the outskirts of Bedford where women are held while their immigration or refugee status is being decided. 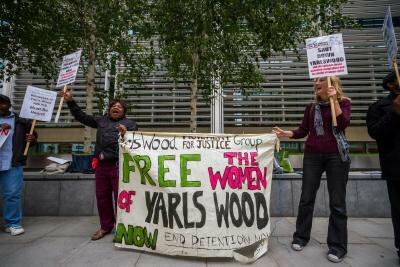 Like much of the UK’s detention centre estate (official names include: immigration removal centres, short-term holding centres and pre-departure accommodation), operations at Yarl’s Wood are kept out of the public eye. Holding to account the multinational corporations paid by the government to run these centres is difficult. They are supposed to be short term holding pens for people who have broken immigration laws; however nearly 30,000 people passed through such centres last year and almost half of those were asylum seekers. Sarah spent four months in Yarl’s Wood. She remembers clearly one incident when the Home Office tried to deport her but were unable to find an available flight. Meanwhile, she waited at the airport for more than 12 hours, heavily pregnant and tired. They eventually took her back to Yarl’s Wood where she was met by her Home Office case worker. “He said, ‘It’s people like you who won’t go when you are told to go, I don’t know why you are still here. It is people like you who are flooding the NHS because of you I have been on a waiting list for an operation, which I haven’t gotten for six months. So if you think that you are going to be released, you have another thing coming. I will do everything in my power...’” Sarah’s caseworker is not alone in holding these views. The Department of Health published a widely challenged report last month suggesting that temporary migrants cost the NHS £2bn a year, which follows plans to impose extra charges for migrants who need healthcare. Sarah continues: “I am actually quoting him. ‘I will do everything in my power to make sure...either you go on a plane and go back to your country or you are going to give birth in prison.” Eventually she was granted temporary release. The caseworker’s comments were made back in 2008. Yet in the last five years it appears that, in spite of widespread protest against conditions in detention, including a specific focus on the treatment of women, little has changed. The comments are echoed by Theresa May, the Home Secretary, and regularly haunt discussions about “immigration”. In such discussions terms are used vaguely and thinking is rarely precise. A phrase like immigrants “flooding the NHS” can be found in most mainstream media or the discarded notes of an ambitious politician’s speech. In this context facts are superfluous; immigrants and asylum seekers are not flooding the NHS, but the statement is always accepted as a sort of truth. It is these half truths that appear to infect policy, which ignores reality and means the real problems like a defunct asylum and immigration system or lack of short-term visas for low-skilled and poorer migrants can never be dealt with in practice. When trailing her current Immigration Bill to the press Theresa May said: “It is unfair that illegal immigrants, people that have got no right to be here, can live apparently easily getting access to bank accounts, driving and so forth.” The Immigration Bill is designed to make it difficult for certain groups to settle in the UK. It will give state officers greater power to search individuals or premises, and to collect and retain biometric data, and if a person refuses to give this data their application or claim may be disregarded. It also places more limits on the human rights granted to poor migrants and refugees, in particular their rights to appeal deportation. Responsibility for policing people defined as “illegal” will fall to private landlords, bank managers, and doctors. In essence, ordinary people will become complicit in policing ‘illegality’. Yet the lack of meaning in May’s comments, and in this fear mongering around ‘illegality’ is striking, which makes it difficult to ascertain what the Bill is supposed to achieve and how success will be measured. The term “illegal immigrant”, as well as dangerously nonsensical, is supposed to refer to those who break immigration laws, but in popular culture and action it is a catchall phrase often denoting poor migrants, stateless people, and refugees. May herself perpetrates this smuggling of language from one domain to the next. In the same interview she says, “It is unfair that somebody can appeal after appeal.” Here, she equates those referred to as “illegal immigrants” with those who appeal against a negative asylum application, i.e. refugees. This is despite criticism of the way UKBA handles initial asylum decisions, which necessitates a robust appeal process. In 2012 27% of all applicants initially refused successfully appealed the first decision; up to June 2013 25% of appeals were successful. Yet in 2012 there were 21,955 asylum applications in the UK compared to 180,000 foreign students and 179,000 foreign workers. Lydia is exactly the type of person May wants to deter from an “easy” life in the UK. The 42-year-old arrived in the UK from Cameroon in 2001, and after being refused asylum, lived here for more than 10 years. However, she was homeless, never had a bank account, and did not see a doctor until 2009. Last year, she was granted temporary leave to remain. Yet the easy life still eludes her. She has joined the ranks of Britain’s poorest; she is currently in receipt of Job Seeker’s Allowance, which mostly goes towards topping up her rent and heating the tiny bedsit she lives in. Though depressed and in “pain” because of “immigration”, Lydia is unlikely to remain on welfare for long. She is desperate to save money to return to Cameroon. While she searches for a job, she volunteers for Women for Refugee Women, a charity in East London. She also visits people in detention centres to offer support and empathy. Who are the “illegal” people the Bill is supposed to target? It is important to have a clear definition since the Bill itself gives ordinary individuals the power to decide. Will they use an accurate legal definition or act on what they read in the papers and hear from the Home Secretary herself? In 2010, 74% of asylum applications submitted by women were refused at first decision. Women for Refugee Women works with many women who have been refused; having fled persecution and sexual violence in their own countries it can be hard to begin a second battle here in the UK. As a result the impact of a refusal for women is harsh, long years of destitution often lead to depression and suicidal thoughts. In a survey of 30 of its members earlier this year, Women for Refugee Women reported that 23 had experienced destitution, 10 for more than three years, 16 had slept outside, 15 were suicidal, and 3 had been raped. The charity says: “One woman in her twenties, who had claimed asylum from Uganda, had been refused asylum and become destitute in 2009 to the present day. She had been sleeping rough in the month before she talked to us, and had been raped on the streets.” This is a reality. Poor migrants like Sarah and asylum seekers like Lydia without legal documents already know what it is to be less than human or ‘illegal’ in the eyes of the state. The Immigration Bill risks making all of us complicit in that regime.